In July 1985, a baby murderer stood in the dock receiving his punishment for committing "the worst crime in the land" from a judge. David Gaut, then 21, was sentenced to 32 years after being found guilty of torturing and killing 17-month-old Chi Ming Shek by fracturing his skull. He paid for his crime, or so he thought, and was released in 2017. But after going next door, Gaut was brutally killed, stabbed 176 times by Ieuan Harley. Harley, 23, had been "horrified" by Gaut's past and wanted to "chop him up and put him down the plughole", his trial heard. He is now facing his own life sentence after being found guilty of the retribution murder. Image caption The discovery of Mr Gaut's body left residents "scared and uncomfortable"
While Gaut was found dead at Long Row, Elliot's Town, last August, the murder's roots are in another part of Caerphilly county - the Mornington Meadows estate, 33 years earlier. This is where Jane Pickthall ended up after moving to south Wales from Scotland with her Chinese waiter boyfriend and two children. The couple split up and she became a tenant at Dol-yr-Eos with sons Georgie and Chi Ming Shek, known as Marky. In December 1984, her new boyfriend, the unemployed David Gaut joined them, according to court reports from the time. It was on an evening in February 1985 that he looked after the children while she visited a friend. After returning at 01:30, Gaut reassured her they were fine and she went to bed, lying-in the next morning as her partner took Georgie to nursery. At 10:00, she woke and checked on Marky - finding his cot broken and her son under a toppled chest of drawers. Ms Pickthall picked him up, put a nappy on him and cuddled him wrapped in a jacket for an hour. "I knew he was dead because he was cold and stiff but I just did not want to believe it," the Western Mail reported Ms Pickthall telling Gaut's trial. 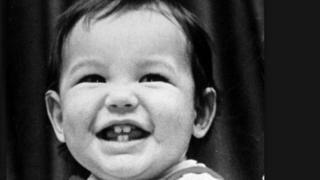 Marky died from a catalogue of injuries that included a broken arm, lacerated liver, torn spleen and fractured skull. He also had bruising on his legs and abdomen and a burn on his foot. Prosecutors described him suffering "a series of assaults" that could have included punching, kicking and being thrown against a hard surface. Gaut did not give evidence and gave various excuses to police, including blaming his girlfriend. "I remember now. When Jane came in from her friend's, she gave the baby a pasting upstairs," the Rhymney Valley Express reported him saying. "It all came back to me in the cells when you said he had bruising on his legs." He also claimed Marky got out of his cot and fell down the stairs. It was called "the worst crime in the land" by Mr Justice Caulfield, who said: "The person you murdered was a defenceless little baby and on the jury's finding you not only murdered that child, but also tortured him." Gaut spent more than three decades behind bars while Ms Pickthall returned to Scotland. When released in 2017, he settled 11 miles from the scene of the crime - in the heart of the Rhymney Valley's former coalmining area. Rows of terraced houses hug the mountainside around Elliot's Town, where Gaut moved into a small flat. It was accommodation meant for over-50s, according to some residents, but had seen younger people with drink and drug problems move in. Mary Jones lives near where Gaut was housed, close to David Osborne, who went on trial with co-accused Harley. It was there that Gaut was murdered, and later Osborne would admit perverting the course of justice for his role in concealing evidence about the killing. "The kids used to play out here in the summer but they don't come now," she said. Ms Jones got on well enough with Gaut to invite him for Sunday lunch when he had no gas or electricity. However, he gave her a different account of his past. "He told us he had been to prison for shooting a soldier but I didn't ask him about it," Ms Jones said. She added: "If he was going to the shop he would ask if we needed anything. "He did wrong but he did his time. But I don't think he should have been brought here." It was in the days leading up to his death that word started spreading that Gaut's victim was not a soldier but a baby. Police found evidence of internet searches, with the trial hearing Harley and Osborne were "sickened" and vowed to "chop him up and put him down the plug hole". On the night he was killed, Gaut received a text from Osborne inviting him around with some DVDs. But prosecutors said this was just a "ruse". He was then stabbed by Harley 150 times while alive and a further 26 times after he died. His body was then dragged back to his own flat, before his car was set alight to destroy evidence, the trial heard. Osborne's friend, Darran Evesham, 47, was found guilty of perverting the course of justice for helping cover-up evidence. Harley was found guilty of the same charge. Evesham had earlier been acquitted of Gaut's murder on the direction of the judge, while the jury cleared Osborne of the murder or manslaughter. "When I heard what happened to David I wanted to move away," said Ms Jones. "We've had problems with druggies before and I wanted to move then." Another resident, Brenda Thomas, said: "I was quite frightened after it happened and felt I had to keep my door and windows locked." Sarah Davies' daughter was four, and she was left feeling "uncomfortable and unsafe", adding: "You don't know if there are other people like him who have been re-housed here." While CCTV has been installed and given residents peace of mind, the killing cast a shadow over Long Row. For David Gaut, he thought he had paid his price for a crime three decades ago and could start a new life there - but Ieuan Harley had other ideas.